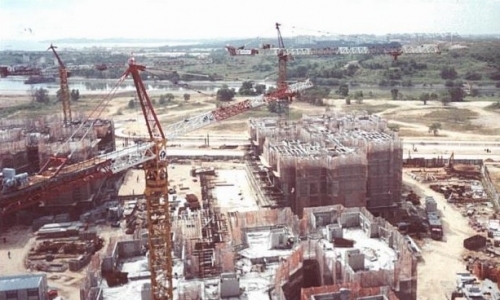 The Housing and Development Board (HDB), as Singapore’s public housing authority, has an impressive record of providing a high standard of public housing for Singaporeans through a comprehensive building program. As part of quality assurance of new HDB tall buildings, it was decided to perform long-term structural monitoring of a new building for a project at Punggol East Contract 26. This monitoring project is considered as a pilot project with two aims: to develop a monitoring strategy for column-supported structures such as buildings and to collect data related to the behavior and health of the building. 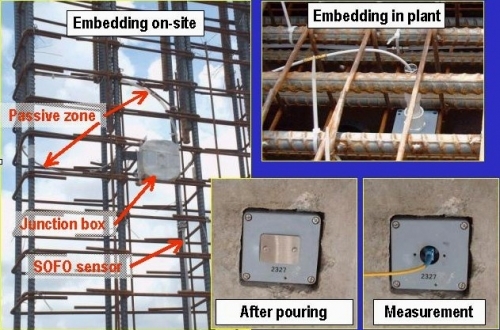 The monitoring was performed during the lifespan of the building and for the first time the sensors were used for life cycle monitoring on high-rise buildings. 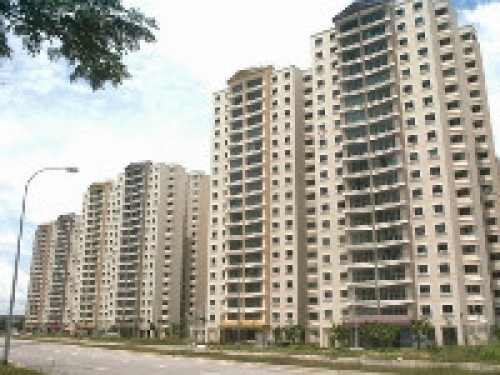 The Punggol EC26 project consists of six blocks founded on piles. Each block is occupied by a nineteen-storey tall building, which consists of 6 units supported on more than 50 columns at ground level. The block called 166A was selected for monitoring. The aims of the monitoring were (1) to increase the knowledge of real structural behavior, (2) to control the construction process, (3) to improve the safety during the service, (4) to enhance the maintenance activities and (5) to evaluate the structural health after risky events such as an earthquake, strong winds or terrorist attack. The monitoring is performed at the local, column level and at the global, structural level. The ground columns were selected for monitoring because they are the most critical elements of the building. A total of ten sensors per block were embedded in the columns and for aesthetic reasons, the small connection boxes for protecting the sensors were also embedded. During construction the readings were taken manually, but after completion all of the sensors were centralized and monitored from a control room. The use of fiber-optics sensors on such a large scale to monitor high-rise buildings was a first in Singapore. This initiative will help designers better understand the behavior of tall buildings during their life cycle (from construction to service). Such pioneering efforts have already yielded results from the insights gained from the real column behavior during construction and the unexpected behavior of column C9. This additional knowledge will help in the research of accurate modeling for complex structures. 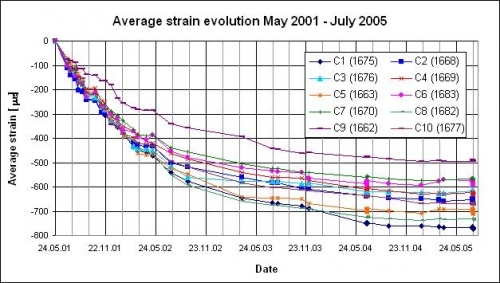 The detailed analysis of column behavior was performed using SOFO Pro Software and most notably, the Concrete Analyser macro-sensor. 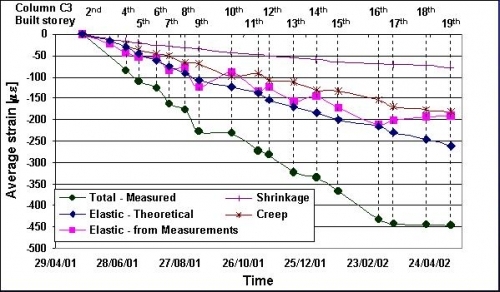 It was possible to separate different parts of measured total strain such as elastic strain, creep and shrinkage. 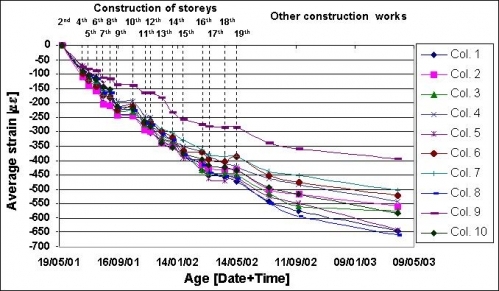 The employed monitoring strategy and the selected SOFO monitoring system have successfully responded to the design criteria, which showed high performance despite limitations imposed by design criteria (limited number equipped columns, lack of temperature measurement, lack of accurate shrinkage and creep coefficients, uncertainty concerning the real load during campaigns of measurement, etc. ).